I was sitting in the audience feeling very sorry for myself, overweight, unfit and feeling miserable. I had Rheumatoid Arthritis, Endometriosis, Asthma and Osteopaenia of the spine. It was Wednesday at 5.30pm – not the best day of the week for me! But I hauled myself to attend an awards night at the Diamond Bar because my mum rarely asked me to attend things due to her being so private. It was an honour and I had no idea what I was in for. By the end of the night I was in awe, I was inspired and felt that if these women could do it then anything was possible. That night I met someone that would change my life forever – Broni Mc from Catch Fitness! Her passion for supporting women and their families was just what I needed. Hearing my mums name called out as a finalist for Lifestyle Changes is a happy memory I replay often. She was over the moon and I was just so inspired that moment changed my life forever. I met Carol Hides, personal trainer, and the following February we had formed MCG Whanau and were all training at least once a month with Carol and out and about enjoying the countryside. 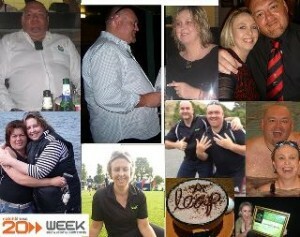 Thanks to the 20 Weeks the MCG Whanau became fitter, healthier and stronger. In my first series as an entrant I walked the City2Surf 6kms on my nordic poles and Mum walked with me. As I came into the stadium I couldn’t stop crying. I was overcome by the emotion of what we had achieved in six weeks. Riwai raised $1500 for the Heart Foundation and debuted the Tutu. My specialists told me I would be in a wheelchair by now and here I was walking with my husband, mum and my nana. A tradition that would continue until nan passed. The 20 Weeks was magic and the feeling we had steered me into knowing I had to become a trainer to help others like me. Our awards were held at the Millennium Hotel and that night MCG Whanau won many awards. We took home the teams , Riwai and I also won awards. The night is a blur but the prize led me to meet Mike Catton and Amanda Mortimer. Riwai and I are still in contact with Amanda. That night also led to me meeting two other amazing woman who would change my life – Tracey Butler-Dempsey and Barbara Millar. These two gorgeous women shared with me that having curves was ok in this industry and that the 20 Weeks competition was the place for it! Carol connected me with Max and I started my personal training certificate in the CTV building for the second half of 2009 while also becoming a finalist in best changes to overall body shape. It was an amazing year. The recipe worked, 20 Weeks allowed me to learn how to be a world class PT, it gave me the framework to support those who needed it in an empowered way. I became a trainer because of the 20 Weeks. I knew that I wanted to work with clients just like my mum, aunty, my husband and me. For the first time in my life I was part of something that fitted all those that didn’t fit in the traditional gym environment. The journey has not been easy and although I pull it off in public like all of us this industry takes it toll. This February marks our fifth anniversary – to me it feels so much shorter but I guess that’s to do with the 12,000 odd earthquakes, half a dozen snow storms and six premises we have been in over our short life span. I have met some incredible people in this industry and know I will continue too. This industry has given me the most fabulous memories, the best client base a girl could ask for, a lifestyle that suits my failing health and a husband who is still alive to share all of this amazing stuff with. I get to travel the country and the world, and be the best I can be sharing what I know to others just like me who were struggling. I still have Rheumatoid Arthritis, Endometriosis, Asthma and Osteopaenia of the spine. I also have a degenerative back disease and on crutches more and more – but my specialists say my new lifestyle is keeping me upright and out of a wheelchair! Next month I will open my home studio ‘Beyond the Gate’. I want my tribe to have all the opportunities to feel the magic like I did as a contestant in 2009.